The magic of the moon is something that many modern Pagans find compelling. After all, for thousands of years the moon has been a source of folklore, myth and legend. One of the most intriguing aspects, from a magical perspective, is that of a lunar eclipse. Since the moon doesn’t emit any light of its own, what we see of it in the night sky is sunlight reflected off the lunar surface. A lunar eclipse occurs when the earth’s shadow blocks the sun’s rays, causing it to appear temporarily darkened. Unlike with a solar eclipse, which can only be seen in a few parts of the world as it happens, a lunar eclipse can be spotted by anyone on the nighttime side of the planet. There are actually three different types of eclipses. A penumbral eclipse takes place when the moon passes through only the outer edges of the earth’s shadow, or penumbra — it’s often very subtle and many people don’t even notice it. A partial eclipse involves part of the moon traveling through the earth’s umbra, which is the more direct, centralized part of the shadow. Because the earth, sun and moon don’t form a direct line during a partial eclipse, we’re often still able to see the moon in the sky during one of these events. The total eclipse is what we see when the earth’s shadow completely blocks the moon, and it goes fully dark for a period of time. Many times, the moon appears to be a reddish or bloodlike color as the event takes place. This is what many people think of when they hear the words “lunar eclipse,” and it has been a harbinger of major events in many cultures for a long time. 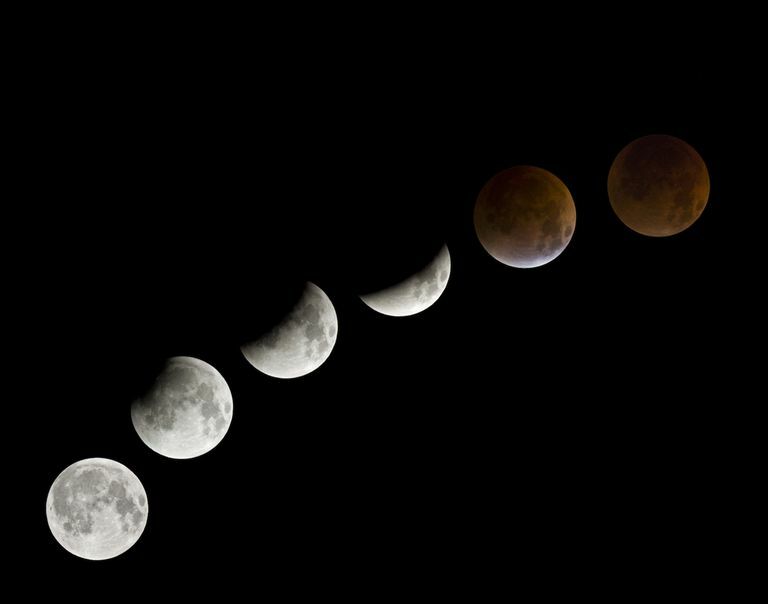 Let’s look at some of the myths, legends and magic that surround the phenomenon of the lunar eclipse. Christopher Columbus knew that a lunar eclipse was coming in February 1504, thanks to his handy-dandy almanac. He used this knowledge to scare Jamaican natives into offering food and shelter to his men, telling their chieftain that God was angry the natives wouldn’t help him. He said God would turn the moon blood red, and then make it go away completely, as a way of expressing his displeasure. Sure enough, the moon disappeared, and there was a great deal of terror among the locals. Right as the eclipse was about to end, Columbus said that God was going to forgive the natives as long as they kept the sailors fed. The moon reappeared, and Columbus and his men ate well until the next Spanish ship arrived. Some practitioners see the eclipse period–which is generally pretty short–as being the equivalent of an entire lunar cycle packed into one brief event. After all, the moon has the appearance of waxing, waning and reappearing during an eclipse. In some modern magical traditions, a lunar eclipse is considered a sort of metaphysical bonus round — in other words, any spellwork you do during this period is amplified and has a bit of extra power behind it. Spells related to increasing your intuitive awareness and psychic ability, as well as divination and wisdom. Healing magic or rituals, particularly those that tie in to women's mysteries or reproductive health. Rituals that connect you closely with deity, such as Drawing Down the Moon, or other spell work designed to invoke the god or goddess of your tradition. Any working related to developing your magical skills. Rituals that honor lunar gods and goddesses–now is a really good time to make an offering to them! Finally, remember that even if an eclipse is taking place where you can’t see it — it’s raining, there’s a cloud cover, or you’re just stuck inside for some reason – you can still take advantage of its power and energy. It’s out there and it’s happening, so make the most of it and use it to your own benefit.